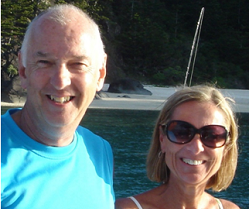 Owners John and Vicki Rennie opened the doors on June 29, 2013 and they have partnered up with specialist providers in the area to bring a complete range of services. They look forward to supplying their customers with all their computer needs from the front of 2 Haswell Street, Greytown. John is managing the business and he has a background in IT spanning 35 years, most recently coming from working as technical support for Payroll and HR systems at the ANZ Bank. A keen sportsman, John has played and coached provincial hockey. He now plays golf when time permits. John is often seen driving around Greytown in his work car with his black labs, Max and Zoe and Kelpie, Bindi. “We can provide all your computer servicing needs from a tune-up and clean, through to a full build and install for your specific needs,” says John. South Wairarapa Computer Services are located in the ‘Property Brokers’ building on the street you turn down to Fresh Choice.